Are HTTP and HTTPS the Same Thing? What Do HTTP and HTTPS Stand For? If you've ever seen an 'https' or 'http' in the URL address of a website, you might have wondered what it stands for. These are technology protocols that make it possible for web users to view links, jump from link to link, from page to page, from website to website. Without these technology protocols, the web would look very different. In fact, we might not even have the web as we know it today. Here's more in-depth information about both of these web protocols. HTTP stands for HyperText Transfer Protocol, the primary technology protocol on the web that allows linking and browsing. This is the technology used to communicate between web servers and web users. This protocol is the foundation for large, multi-functioning, multi-input systems — like the World Wide Web. The web as we know it would not function without this bedrock of communication processes, as links rely on HTTP in order to work properly. 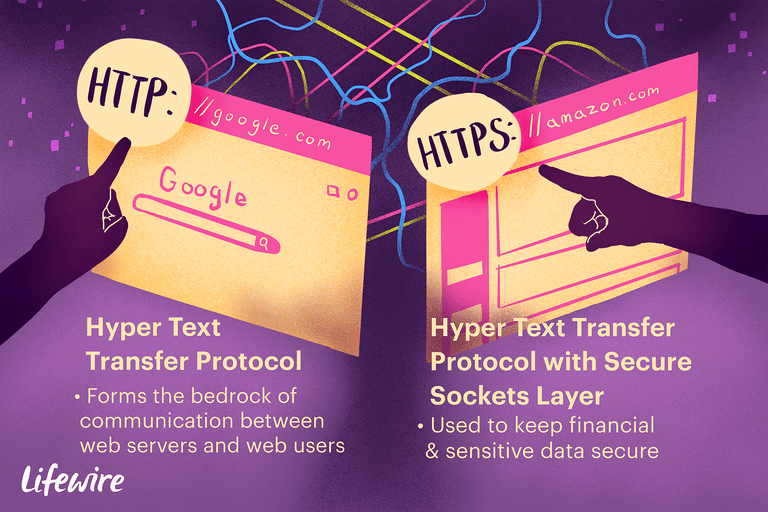 HTTPS is HyperText Transfer Protocol with Secure Sockets Layer (SSL), another protocol primarily developed with secure, safe Internet transactions in mind. SSL is a secure encryption Web protocol used to make data safe when transmitted over the internet. SSL is especially utilized on shopping sites to keep financial data secure but is also used on any site that requires sensitive data (such as a password). Web searchers will know that SSL is being utilized on a website when they see https in the URL of a web page. So when you navigate to a site like Amazon or eBay and you go to pay for something, either through a secure shopping cart or an outside payment system such as Paypal, you should see the address in your web browser address bar change significantly if the site you have arrived at is an https site, because the https in front of the URL indicates that you are now in a secure session. For instance, you might log into your bank account on the web. You will have to enter a username and password, and then after that, you'll see your account info. Pay attention the next time you do this, and check the address bar at the top of your browser. It should indicate that you are now in a secure session with the addition of https at the front of the URL. If you do not see this added layer of security when you're on a website that is potentially asking you for your financial or personal information, do not proceed! You are in danger of having your information hacked or compromised. For added security, always log out of any secure session when you're done, and especially if you are on a public computer. This is just good common sense. Even though a website can be completely secure, using all the information and technology we've talked about in this article, you can leave your information exposed to someone else if you do not log out securely. This especially applies if you're on a public or work computer where the network might have more access to your information than you would prefer, but also applies to a more private network (home), especially if you want to keep your information secure and non-compromised. Bottom line, it's smart to always log out of any secure session that involves your personal or financial information in order to keep yourself as safe as humanly possible. What's the Difference Between SSL and SSH?